Author note: Chicken can be substituted for turkey. 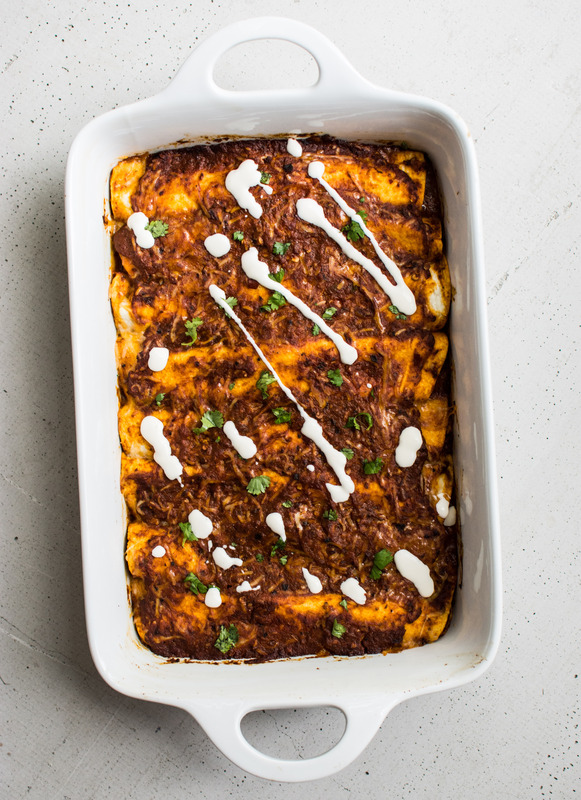 The turkey recipe for these enchiladas can be found in The Dallas Morning News. Click here for the recipe and full story. In a large flat bottomed pan, melt the butter over medium heat. Add the garlic cloves and flour. Whisk until golden, about 3-5 minutes. Add the warm chicken stock and whisk until combined. Let the sauce thicken for 10 minutes. Whisk frequently to prevent burning. Add 1 1/2 chile sauce (see recipe below) and Mexican crema. Continue to simmer for an additional 10-15 minutes, or until the sauce is thickened. Add the turkey and stir well. Set aside. Evenly spread a few spoonfuls of the extra chile sauce on the bottom of a long baking pan. In a small skillet warm a tortilla over medium-low heat. Dip both sides of the tortilla into the chile sauce. Lay the tortilla onto a plate. Fill with the chicken mixture and a sprinkling of cheese. Roll the tortilla tight and place into the baking pan. Repeat this process until all the tortillas are used or the pan is full. Lightly cover the enchiladas with additional cheese and chile sauce. Top with Mexican cream and cilantro. Serve warm. Place all ingredients into a saucepan and simmer uncovered for 45 minutes to 1 hour. Place the sauce and all ingredients into a food processor and blitz until smooth. Pour the sauce back into the pan. Use as directed. This entry was tagged A Pleasant Little Kitchen turkey enchiladas, Chicken Enchiladas, chile chicken enchiladas, chile sauce, dallas food blog, dallas food blogger, smoked turkey enchiladas, texas food blog, texas food blogger, Thanksgiving enchiladas, turkey enchiladas, turkey leftovers, what to make with turkey leftovers. Bookmark the permalink.